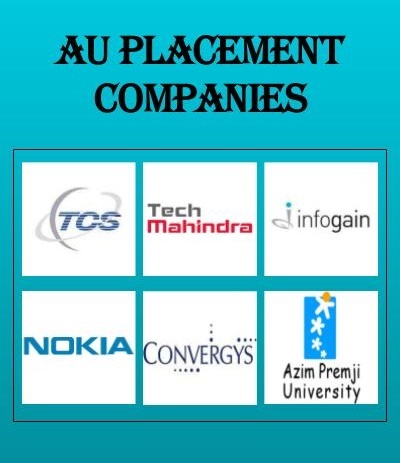 Allahabad University Placements: Allahabad University, [AU] Allahabad has a huge number of companies coming to their campus to recruit students. They also offer various internships for the students of various departments. The internships help students to get an idea about the industrial set up and adjust to the requirements of the industry. It helps them develop skills which will go a long way in helping them further in their respective careers. There are various multinational companies who come here for campus recruitment such as HCL, Tata, & various IT companies along with marketing, finance,etc. The average salary is about 70 thousands per month for the students who got recruited from here. There is a huge alumni network of University of Allahabad having the alumni which are at very high posts now with wide success. I worked marketing level, I got INR 10000 per month. it's very good atmosphere for everything. If we talk about internships, stipend, placements, job e.t.c then I am sorry because I am pursuing my graduation, not any professional subject. I have botany, zoology, chemistry as my subjects so I think these are not enough to fetch me aforementioned things. This is one drawback as the university do not offer bachelor's degree in any professional course if you are opting a B.sc. You get placements for a professional course and not for a regular undergraduate course. Regarding Alumni network, our University organises reunions. Many of the passed out students have joined IAS, IPS, CDS, PCS and other government services. I have worked under Deepak Chaurasia, the senior anchor of Aaj Tak. The average salary is INR 5 to 7 lakhs per annum. Yes, there are many companies related but I am now in the first year Don't. Know It is an association of graduates. The placement process is very good in this college. I have been suggested to apply at this university by ht-campus, an online counseling website for students. Allahabad university is one of the best university that's why many companies visit the campus for recruitment. As it is a government university so companies hardly come. But the alumni is too cooperative and supportive as well. I am currently working as an advocate at the high court of Allahabad. There isn't fixed salary for beginners but after some time you will start gaining money. There is no placement facility in this college. Alumni network is not that good. I would like to join judiciary. But many companies like Adani, Reliance, Suguna Nestle came to hire many of the freshers for legal advice. The minimum salary in law sector could be anything. There are placements in the finance field and also in marketing field and the salary is above INR 500000 per annum both fields so I have to do anything in this field as per my experience. In the fourth semester, one has to do an internship. The internship can be done either here or in other universities. Other universities can give stipend but home college internship doesn't provide any stipend. Project works are there and willing students can take part.